STRAP (Software Tool for Rapid Annotation of Proteins) is a software program developed at the Cardiovascular Proteomics Center of Boston University School of Medicine (Boston, MA). The program automatically annotates a protein list with information that helps in the meaningful interpretation of data from mass spectrometry and other techniques. STRAP requires Windows XP or higher with at least version 3.5 of the Microsoft .NET Framework installed. STRAP takes protein lists as input in the form of text files, protXML files (usually generated by the Trans-Proteomic Pipeline), or DAT files (from Mascot search results). 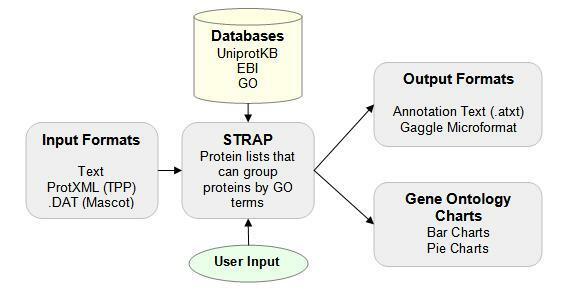 STRAP downloads information from the Uniprot and EBI QuickGO databases to generate protein annotation tables and a variety of GO charts to aid in the individual and differential analysis of proteomics data. Examples of these results are shown in the three figures below. Please select Download for the STRAP program (version 1.5) and the STRAP tutorial sample files. Please select Tutorial for the STRAP tutorial. Please select Quick Start to get started using STRAP. Please select Contact Us for assistance with any STRAP problems. STRAP software was developed at the Cardiovascular Proteomics Center of Boston University School of Medicine (Boston, MA). The program is freely available for external testing. We assume no responsibility for its use, and we make no guarantees, whether expressed or implied, about its performance or any other characteristics. We would appreciate acknowledgment of our organization if the software is used. Vivek N. Bhatia, David H. Perlman, Catherine E. Costello, and Mark E. McComb, Analytical Chemistry 2009, 81(23), 9819-23. Mark E. McComb, David H. Perlman, Stephen A. Whelan, Deborah A. Siwik, Vivek N. Bhatia, Wilson Colucci, Richard A. Cohen, and Catherine E. Costello, ASMS 2011, Denver, CO.
Vivek N. Bhatia, David H. Perlman, Catherine E. Costello, and Mark E. McComb, ASMS 2009, Philadelphia, PA.